I have a big Egyptian face in my aquarium. I've had my aquarium for about 2 months. 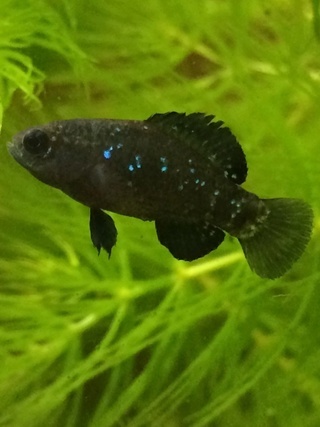 I noticed in the last 2-3 weeks brown spots appearing on the face. It doesn't seem to be anywhere else. There is no sunlight where the tank is only artificial light. No real plants and I have freshwater with 6 tetras and 2 Cory cat fish. I'm worried it might be harmful. It seems to be getting darker too. I attempted to wash it off but it came back again. Anyone know what it is. I have a picture. Is there a way to attach it? This is algae, your tank is young and this kind of algae is often coming early. It is not armful, it just does not look nice but a sign there is live in your tank.! Welcome to the forum and thanks for asking. I would agree with francois that the brown spots on the Egyptian ornament are a brown algae. To post a picture, see this thread. This may sound like a silly question, but what does it 'feel' like when you touch it? Slimy, gel-like, smooth, or like 'nothing'? It could be some sort of brown algae. Curious - What is your light routine, feeding routine, do you have hard water, and what do you have running for filtration/bubblers, etc.? 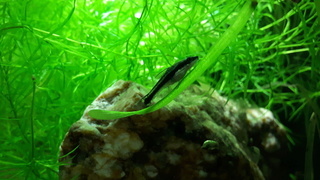 Also, again, just curious - as I love cories and tetras - what type do you have? Unless there is a problem in the tank, I tend not to worry about algae - it eventually looks kind of natural and the fish seem to like it! 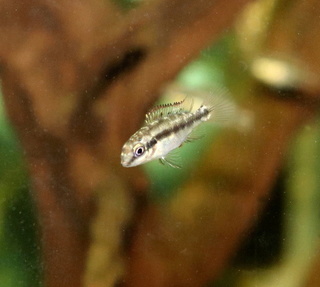 Drop by the introductions section when you have time and tell us about your new aquarium. Times two - introduce yourself and your tank! @Catfishlover wrote: There is no sunlight where the tank is only artificial light. I'm worried it might be harmful. It seems to be getting darker too. I attempted to wash it off but it came back again. If you really want to get rid of it, and sterilize the ornament, take the ornament out of the aquarium and dip it in hot boiling water. That will kill just about any living thing on the surface and not introduce any fatal soap or detergent into the tank. If you still have not conquered the algae, my next "go to" would be a weak bleach solution. Remove the ornament from the tank and dip it in a 10% bleach (regular bleach like chlorox, not the colour safe stuff) for about 30 minutes. Remove and soak in a clean water bucket for another hour and then you can replace it. The chlorine bleach will attack the algae in the first dip. The water dip will remove any chlorine residual. (Remember that the buckets that you use should not be used previously with cleansers since there will be cleanser residues). Since you have artificial light, if you switch to CFL bulbs (the Dollar store type) the brown algae should disappear. The higher intensity light will foster other green growth. In general I don't worry about algae. Heck, I'm the king of algae. I even have forests of blue green algae (which is not a true algae BTW). Then again I'm not a plant guy. I felt the spots and they don't feel like anything. But the head is pretty rough and it's hard to feel the texture of the algae. Thanks so much for all your replies. I might just leave it on the head. It seems when I wash it back it just grows back anyway . Maybe I'll try different lighting. @Catfishlover wrote: I felt the spots and they don't feel like anything. But the head is pretty rough and it's hard to feel the texture of the algae. Thanks so much for all your replies. I might just leave it on the head. It seems when I wash it back it just grows back anyway . Maybe I'll try different lighting. Lighting, water flow, and nutrients in the tank may all play a factor . Sometimes it takes playing with the balance of all these factors for a while to figure out solutions. The water does flow on top of the head. Maybe I'll move it over to the side and see what happens. The algae looks like diatoms to me. 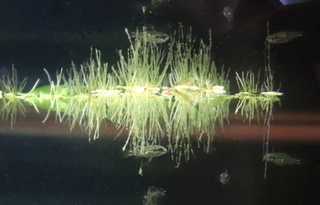 This algae is common in newer tanks. It tends to disappear by itself after a few weeks to months.